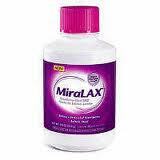 Receive a free sample of MiraLAX, includes 2 one-dose sample packets and a money-saving coupon. Expires 7/31/2011. Limit 1 per household. Allow 4-6 weeks for delivery.